How many times have you looked in your closet full of clothes and determined that you have nothing to wear? Let’s change that by sorting through the keepers in your closet and ensuring that all of your pieces work for your coloring and lifestyle. 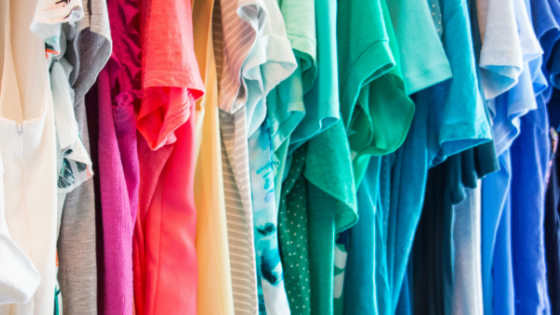 If you’ve been wondering how to clean out your closet, look no further. Follow these four simple steps to clean out your closet and minimize your wardrobe, so you can maximize what you wear. As a military spouse, I am not a collector. Nothing gives me greater pleasure than cleaning things out before a move – it’s cathartic. I have no problem filling the shredder with old paper and making a run to Goodwill with all of those camping supplies we haven’t used in years. When it comes to my closet; however, I sometimes hold on to things for too long. I worry about whether I might need that 70s outfit for a Decade party even though it doesn’t fit me anymore – simply silly! I’ve learned, over the years, to tackle my closet with the same gusto as I do my basement. Yes – these are clothes you wear most often and feel good in. These are clothes that fit perfectly and you feel like you can’t live without. No – the items you haven’t worn in over a year (not including special occasion). These are items that have never felt right, are out of style, or don’t fit. If they did, you would have worn them. Put your No clothes in either the SELL or the SCRAP bag. Place the yes clothes that are everyday items on one side of your closet. Yes items that are more special occasion/seasonal can be put in a STORE bag or moved to a separate closet. Keep your maybe clothes where they are, but turn the hangars around, so you know you haven’t worn them. You might consider sorting them by like items and color as well. Now take a break. You might just have a cup of tea or a glass of wine and then move on to Step 3 or you might want to wait for a bit to see how you are wearing your “yes” and “maybe” items. If you take a longer break, track what you are wearing and how you feel about each item. Potentially use a wardrobe organization app to help you analyze (I wrote a post about Wardrobe journal you can check out). When you’re ready, move on to Step 3. It is in your color palette or in harmony with your color palette (usually same temperature and value – your fan should not get muted or become garish against the color). If you don’t know your color palette consider completing a personal color analysis. Lastly, in my opinion, you want to make your closet cute. Make it a place where you want to be. It should make you happy and not overwhelm you. One way to do that, is to use fun containers that help you stay organized and also are super cute. You can use these for your closet or for your pantry. If you are looking to purchase organizing supplies that are functional and cute Shop Thirty-One Gifts. Please note that I am not an affiliate of 31 Gifts nor will I get a commission.